Work, sleep, eat and repeat. How many of us are slaves to the daily grind? Finding your inner Zen may prove to be difficult when you’re always hustling from one place to another, so why not take a break and have a tiny breather instead? Escape to sheer tranquillity and utter relaxation as you experience one of the best rub-downs in the city. The best part? Timing is extremely flexible from an efficient 15-minute massage to a full 2-hour knead extravaganza, perfect for squeezing in a little me-time in any busy schedule! True to its name, discover a hidden sanctuary within the confines of a bustling city in the form of Urban Retreat Spa. Having received numerous accolades in the past for their award-winning massages, it’s no wonder why loyal customers kept flocking over to their KL and PJ branches. Why you should visit: Their pre-natal massage service is supposedly one of the best you can find in Malaysia, with an experienced masseuse kneading away the stress and strain of carrying a bundle of life. Mums-to-be, you certainly deserve this! Forget layers of concealers and BB creams – a Hammam scrub is all you’ll ever need to feel and look a few shades lighter! 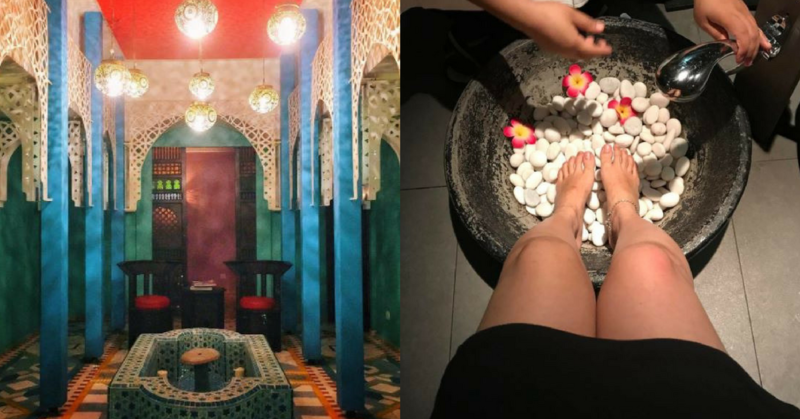 Literally translating to a Turkish bath, immerse yourself in an authentic experience straight out from the Ottoman empire with their gorgeous Moroccan interior with trained masseuse to boot. Why you should visit: Their most sought after signature massage package is a certain must-try – the traditional Hammam and Gommage service constitutes of a vigorous scrubbing exercise that’ll peel away dead cells to reveal a radiant skin all over. There’s no need to cross the border in order to seek for an authentic Thai massage experience – Thai Odyssey transports patrons to a serene setting of quiet bliss and cosy ambiance within a convenient stone’s throw from the city. You’re bound to have a hard time choosing between their signature Traditional Thai Massage, Aromatherapy Massage, Herbal Therapy and Traditional Foot Massage among many others. Why you should visit: Offered in time-based package deals, this proves to be an excellent pitstop for the working ladies seeking to squeeze in some me-time. Be it 30-minutes or a full-blown 3-hour massage fest, you get to decide! With a string of affordable massage packages, there really isn’t a reason not to pop by Erawan for a quick refresh and rejuvenate session. Prices start from an affordable RM58 for a 30-minute reflexology foot massage, so bid goodbye to sore feet and hello bouncy steps! Why you should visit: Highly commended for their excellent customer service, the trained Thai masseurs are bound to treat your bones and joints to some much-need TLC.